Judges comments : This painting quickly caught my eye. 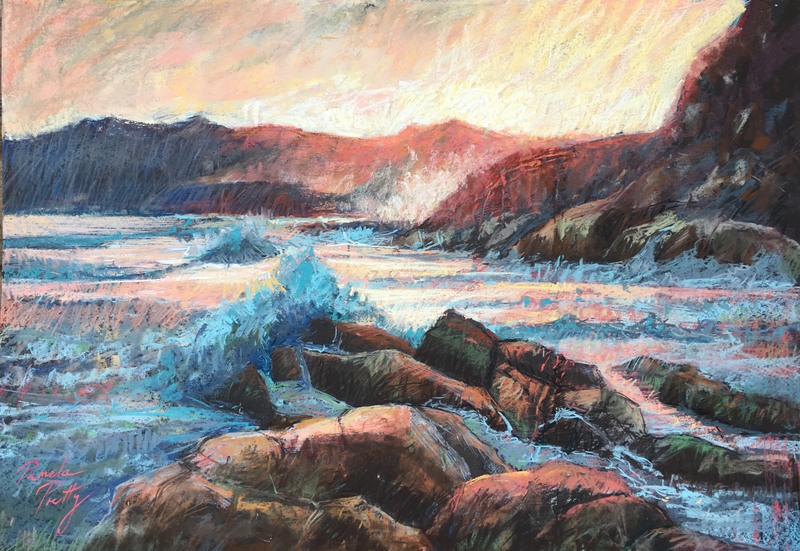 It has light, air/space and a rumbling of the waves about to crash on the rock in the foreground which balance the composition. 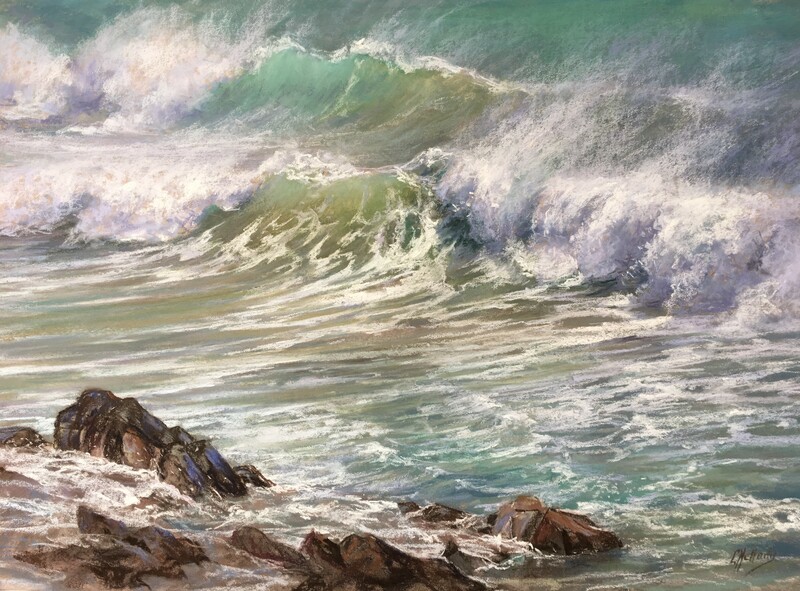 The waves are luminous with fabulous gradations of tone and colour The spray creates the illusion of movement and sped. 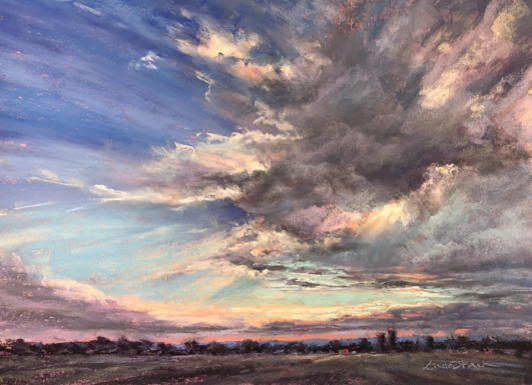 Lyn’s joy of working this painting is obvious and she creates an emotional response from the viewer. Lovely work Lyn. 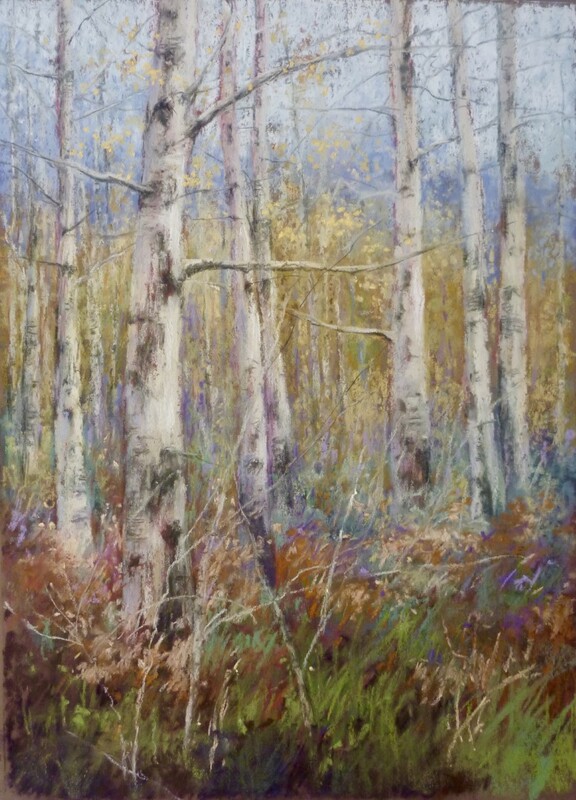 Judge’s comments : The shape of this painting leads the viewer to scan the landscape of all its glorious blooms. Colleen has created undulating depth to a cropped view, balancing the arrangement of colour and using an underlying design structure which takes us to the centre of the painting. Well done Colleen. 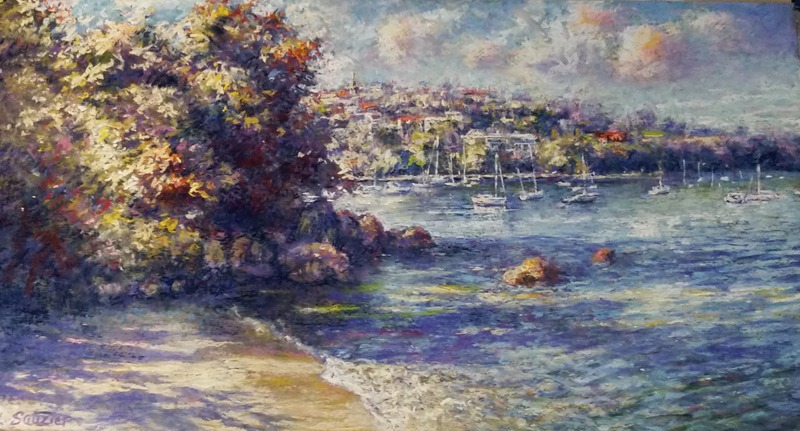 Judge’s comments : This painting captures the essence of the Sydney beaches very well. The consistent mark making creates a near pointillist effect, mingling the pigment of colour strokes to dapple across the landscape. Louis has used a triad of colour with dominating violets enhancing the yellow greens and orange rooftops. An appealing piece. Judge’s comments : A gifted painter taking risks increasing textures that are pleasing to the eye. I really liked this contemporary piece. Caroline has a strong sense of design structure and has conveyed a moment of quiet. 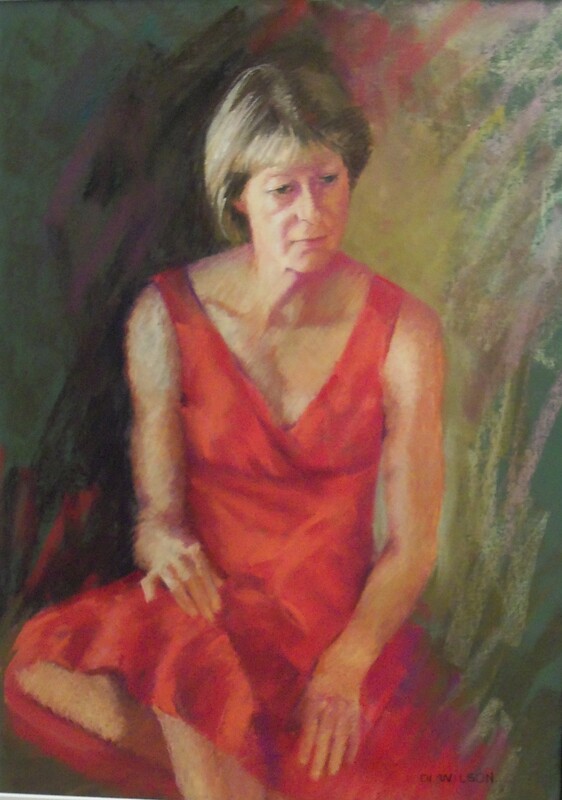 Judge’s comments : Di has produced a beautiful portrait, the pensive thought on the sitter’s face is easy to engage with. 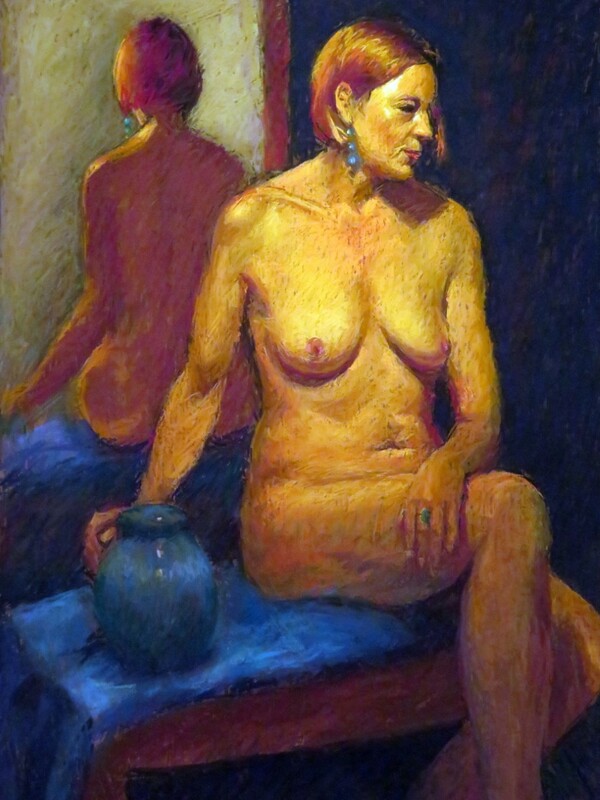 She has used complementary colours and loosely made them sit well behind the model. The red dress reflections in the skin unite the elements of harmony. I lingered quite a while, deliberating over the sitter’s right hand. A bit of an awkward position, however having painted regularly from life myself, I realise the artist doesn’t always have a choice on the angle they are allotted and instantly forgave Di. She understated it enough for me to be distracted back to the beautiful handling of the face. Well done. Judge’s comments : Paula has obviously had a visual concept of what she wished to achieve. The boldness of colour in the background ignites the lights in the foreground to become luminous. She has stuck to her concept and delighted us with sand that beckons our footprints. A strong painting. Judge’s comments : Linda has made a dynamic statement with loosely gestured strokes grabbing the viewer’s eye immediately. Below, a township, preparing for the onset of darkness is quietly described by an abstraction of marks which enhances nature’s explosion of clouds. This landscape is depicted beautifully and the proportion of the composition is well thought out. Nice work. 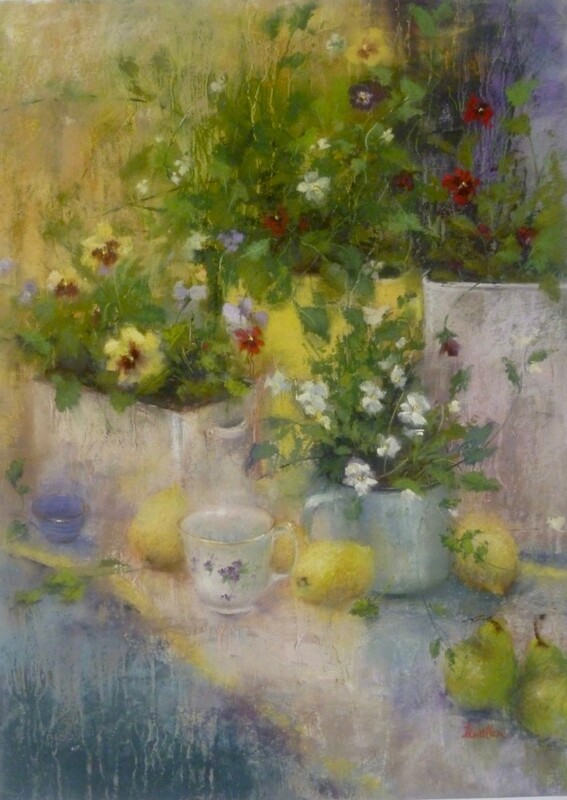 Judge’s comments : The control of tone and soft edges on a small scale has been beautifully handled. 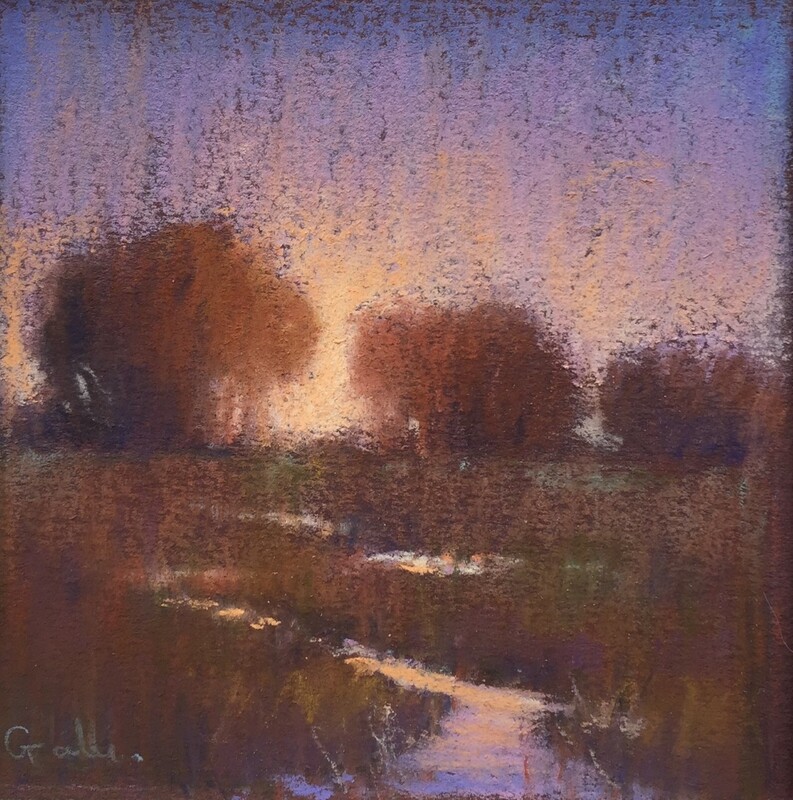 The glowing light of the rising sun and on the path invites the viewer into this small space. A little gem. Judge’s comments : Heather has used the negative space in front of the horse’s head well, to allow space for the horse to tell its story. It reminded me of a fabulous portrait of JFK in the Smithsonian Portrait Gallery in DC. JFK was depicted at the right of the canvas, staring into the void on the left hand side. It was a similar shape to Heather’s pastel and I felt I could read his thoughts. 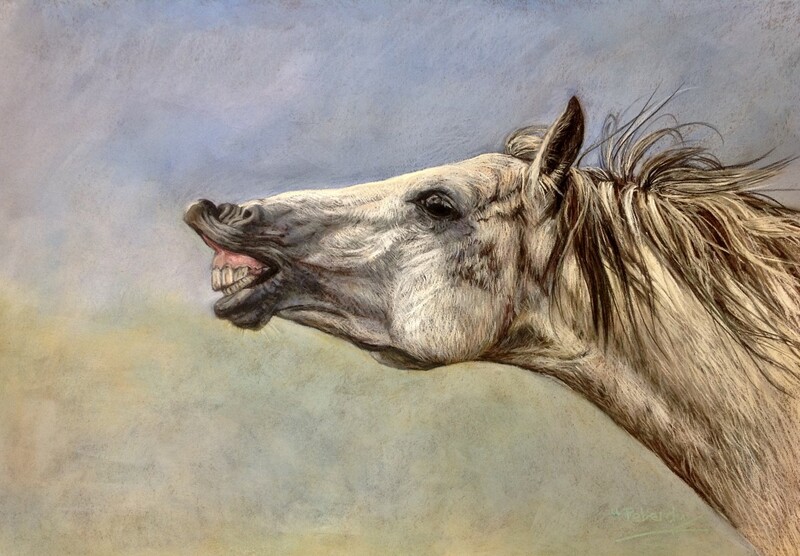 The pastel marks are sensitive to the texture of the horses hair and the colours are rendered harmoniously well. Very nice Heather. Anne has challenged our view and it takes a moment for the realisation that there is a portrait within a portrait. She has created a sense of mystery, which asks the viewer to look more closely. The limited palette has enhanced a complicated composition. Well done Anne. 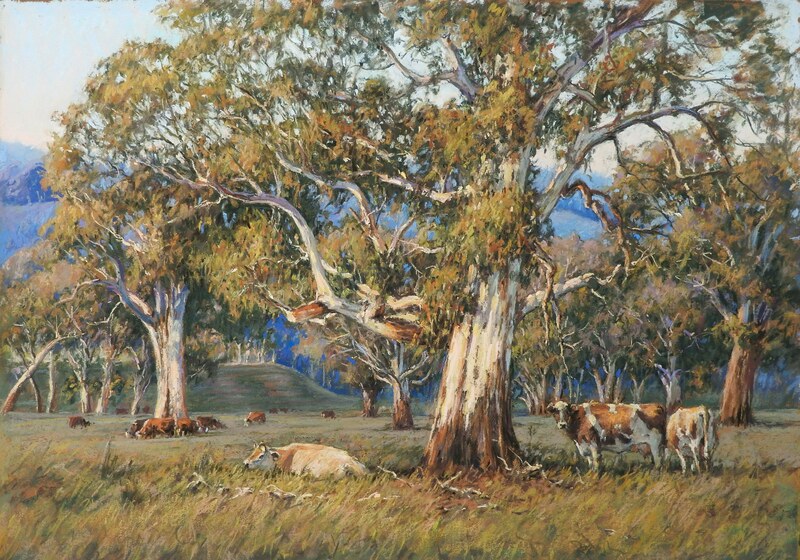 Judge’s comments : Glowing colours, Barbara has fooled us with her title, ‘Study in White’. Masterfully she makes us feel the light without much use of white at all, instead the reflected colours on the white porcelain are a myriad of peaches and violets. Her colours are clean and high key which give the viewer a sense of joy. 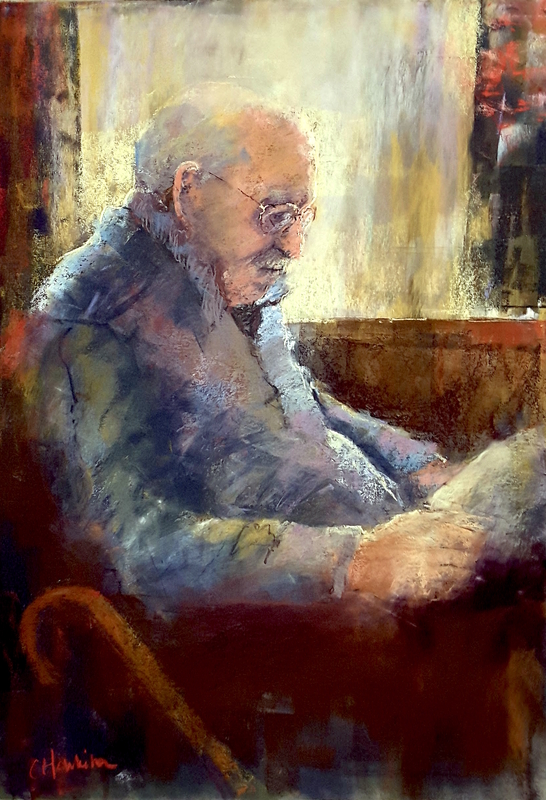 Judge’s comments : A lovely study, a restful moment as the old man reads his newspaper. Catherine has kept the old man in soft light, using no hard edges. It reads to the viewer that this is how it was at the time, in diffused light. The colours too depict a peaceful moment in time. Delightful, congratulations Catherine. 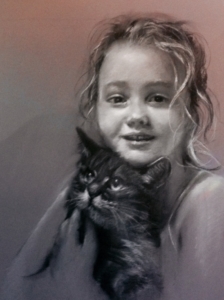 Judge’s comments : A beautiful study of a little girl and her cat. Nola has captured a delightful expression using soft edges and great skill to maintain a youthful look. The little girl’s hair is handled very well. Well done Nola. Judge’s comments : I recognised this place immediately. Peter has picked out the essence of his motif. Those who know Honfleur will realise that it can be a very complicated subject. 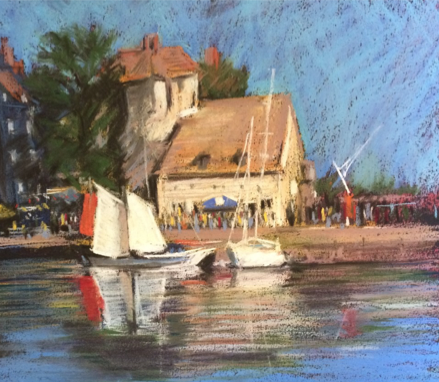 He has focused on the buildings and boats with their reflections in the foreground. The busy street of restaurants are in shades of grey, giving the visual idea of what lays behind his focus. A nice use of reds balance the composition. Nice one Peter. Judge’s comments : A very loose painting in a limited palette. Pamela gestures with a confident hand, the movement she is expressing. The mark making is exhilarating as the viewer takes part in the gazing across the subject. She is very assured of her strokes. Judge’s comments : A well composed painting, with a solid understanding of the human form. Rodney has a skilful sense of design which makes the eye wander over the figure, only to come back to the face. Lovely painting Rodney. Judge’s comments : This painting shows a good structural framework of shapes, which have been assembled to create an excellent composition. With complementary colours, Barbara has made them sing on a black background. 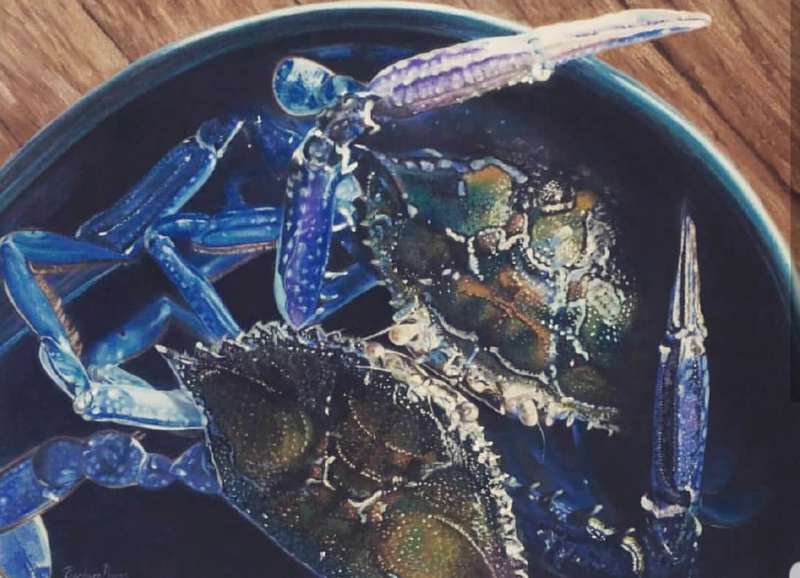 Hinting with an edge of a plate, the artist solves the mystery of shapes. Judge’s comments : Portraiture is a difficult subject, but Danielle is showing us her understanding of the geography of the face. I really liked that she used the blues in the scarf/turban, and throughout the shadows of the flesh. 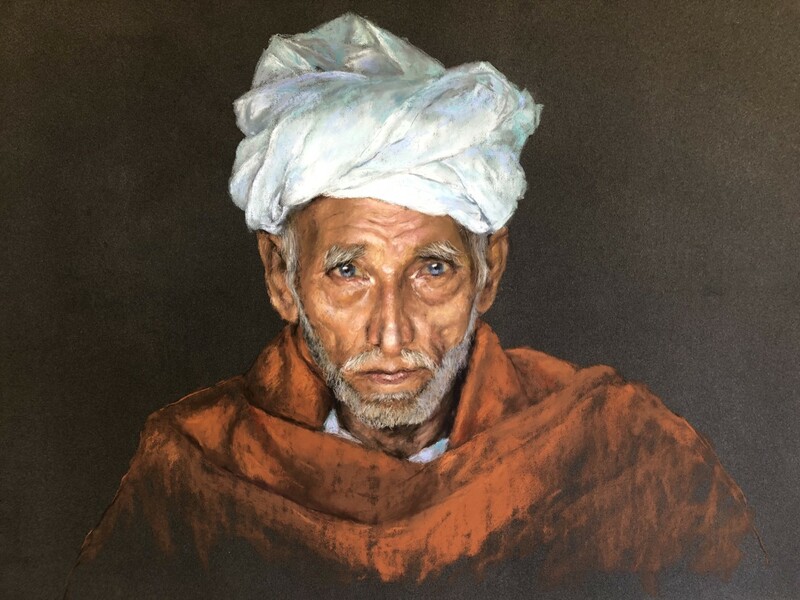 I perhaps would have liked to see a lost edge on the turban, but nonetheless, a lovely study. 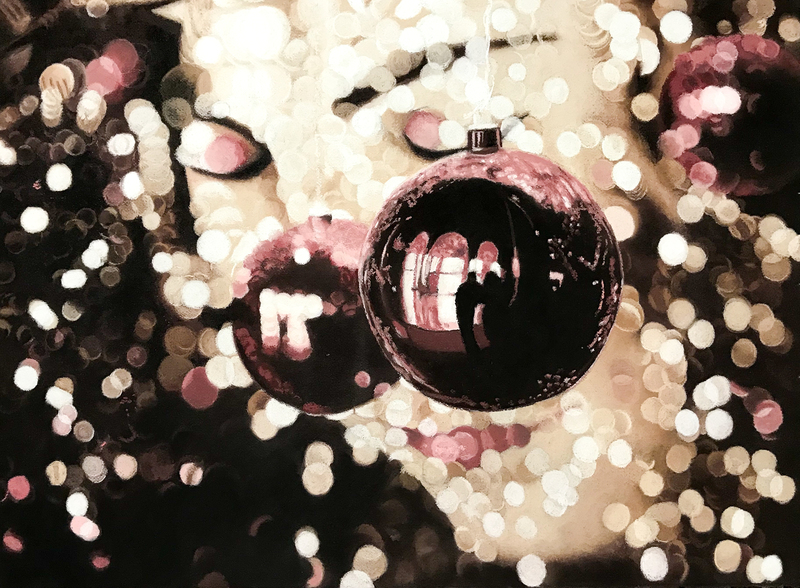 Judge’s comments : By weaving short strokes of colour and tone, Caroline’s little painting lures the viewer, even from a distance, to come look closer. The birches pop with their coolness of colour against the warmer background. A myriad of colours, but she has pulled it off beautifully. Very nice piece. 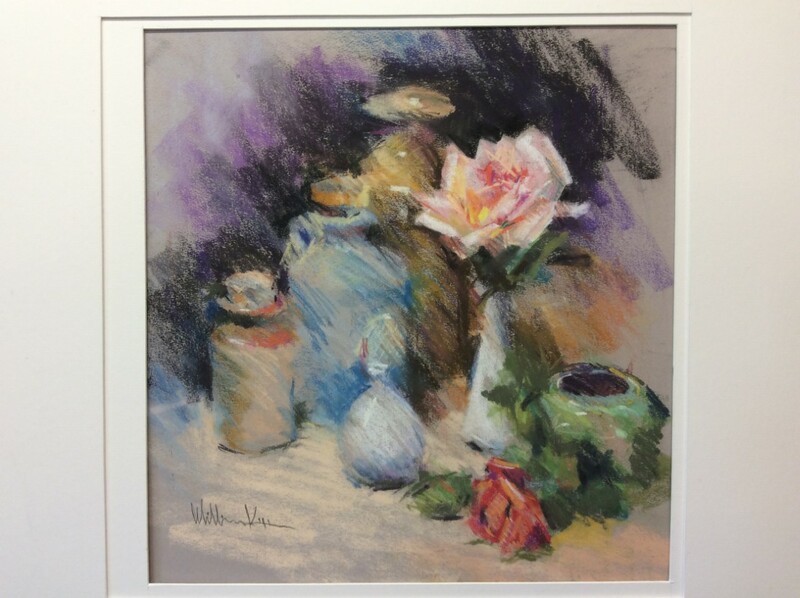 Judge’s comments : With consistent diagonal strokes, William has depicted a soft loose-edged collection of objects. This piece is not overworked, it is spontaneous and full of light. 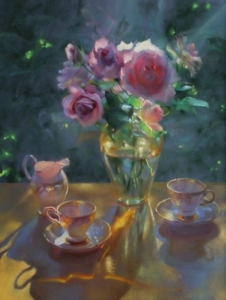 Judge’s comments : This is a serene still life which sparkles – a back-lit subject with reflecting glass on the mirrored surface and the delicate porcelain cups and saucers catching the light on their gold rims. 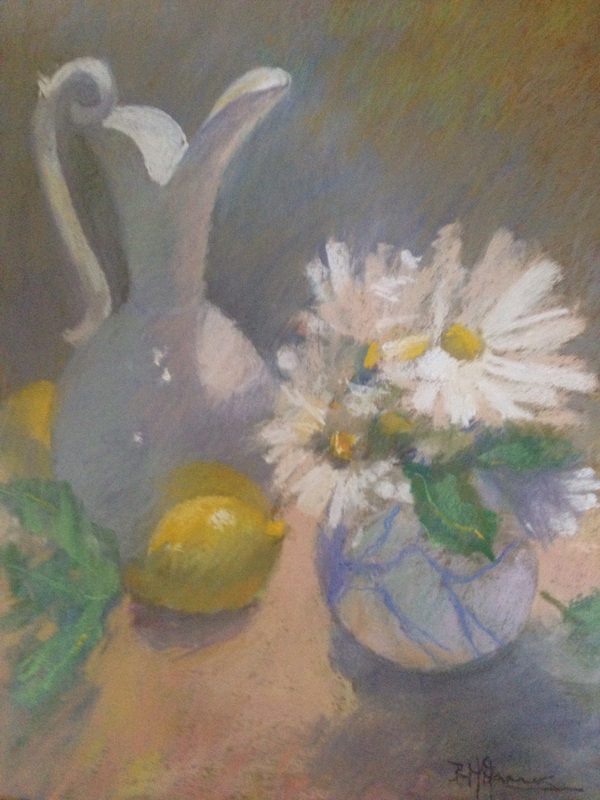 Grace has her own techniques of the application of pastel on paper and is adept at capturing the light and giving an overall glow to her creation. There are very few hard lines – the overall effect being of a beautifully composed image with pleasing symbols of gentle femininity.